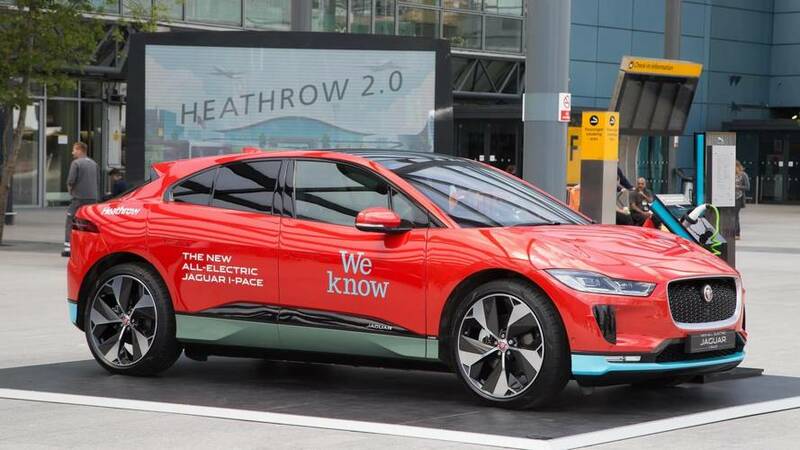 The service, which is being set up by Jaguar in partnership with WeKnowGroup, will see as many as 200 I-Paces used to ferry passengers to and from the U.K.'s biggest airport, forming what will be one of the country's biggest all-electric car fleets. "What we have created in the Jaguar I-Pace is utterly revolutionary; a desirable, luxurious and state-of-the-art electric vehicle that’s practical for genuine everyday use, including the tough life of an airport luxury chauffeur car," said Jeremy Hicks, Jaguar Land Rover UK's managing director. "We have had huge interest and positivity from our customers worldwide. We’re also delighted that this endorsement extends to some of the biggest corporations on the planet. Through our partnership with Waymo (formerly Google self-driving car project) and this latest deal with Heathrow and WeKnowGroup, we’re excited to be bringing the electric future to more people than ever before." The new SUV comes with a 395-hp electric drivetrain, that helps it to reach 62 mph (100 kph) in just 4.8 seconds. Power comes from a 90-kWh lithium-ion battery, giving it a total range of just under 300 miles. It can reach 80 percent charge in just 40 minutes on a 100-kW charger, which are set to be introduced across the U.K. in the coming years. It is loaded with technology too, such as having the ability to automatically cool down or heat up the batteries while it is being charged to ensure the car is in peak condition when it's time to set off. Jaguar's new Touch Pro Duo infotainment system also has a smart sat-nav that examines the upcoming route to give the most accurate assessment of remaining range, bringing an end to the dreaded "range anxiety" that puts so many people off buying electric cars. Tuesday 8thMay, 2018: The revolutionary new Jaguar I-PACE will form the heart of an all-new zero-emissions luxury chauffeur service to and from Heathrow Airport. As many as 200 I-PACEs will be available at Heathrow as part of a deal with WeKnowGroup, creating one of the largest electric vehicle fleets in the UK. The zero emissions chauffeur service will begin running in summer 2018 with the delivery of 50 I-PACE vehicles, along with the option to add a further 150. Having been designed from the ground up as a pure electric vehicle, the I-PACE has a compact footprint but spacious interior, with generous seating for five and their luggage. Paired with its near-silent electric motor and passenger conveniences – including six USB chargers and four-zone climate control – the I-PACE is the ideal luxury chauffeur car. "What we have created in the Jaguar I-PACE is utterly revolutionary; a desirable, luxurious and state-of-the-art electric vehicle that’s practical for genuine everyday use, including the tough life of an airport luxury chauffeur car. We have had huge interest and positivity from our customers worldwide. We’re also delighted that this endorsement extends to some of the biggest corporations on the planet. Through our partnership with Waymo (formerly Google self-driving car project) and this latest deal with Heathrow and WeKnowGroup, we’re excited to be bringing the electric future to more people than ever before." 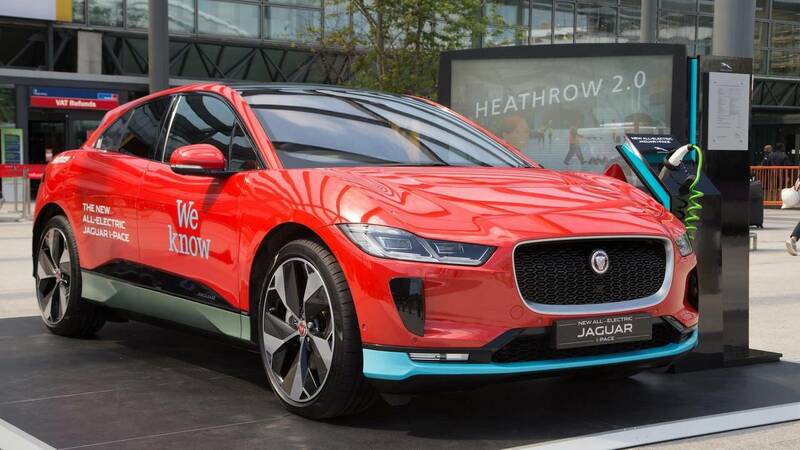 The Jaguar I-PACE’s state-of-the-art 90kWh Lithium-ion battery uses 432 pouch cells, delivering a range of 298 miles (WLTP cycle). On average a chauffeur vehicle drives around 114 miles per day, allowing the I-PACE vehicles to easily complete a whole day’s driving on a single charge – even with passengers, in winter and with motorway driving. With the ability to charge at 100kWh, I-PACE can be ‘refuelled’ from 0% to 80% in just 40 minutes. The I-PACE is also already compliant with London’s January 2020 ‘zero emissions-capable’ requirements for private hire vehicles. With an efficient electric motor and fewer moving parts than a traditional combustion-engined car, I-PACE also brings significantly reduced running costs. Service intervals are set at two-years/ 21,000 miles – far longer than a traditional car – meaning less down time and reduced costs for operators. "This is a significant step change in our successful, decades-long relationship with Heathrow where we operate arrivals desks in all terminals, to assist thousands of travellers every year. We provide transport as well as a broad range of other services including entertainment, hotel rooms, tours, attractions and telecoms products. Today’s agreement also extends our deep, long-standing relationship with Jaguar which has allowed us to proudly claim that we run the largest chauffeured executive Jaguar fleet in the UK." "We are thrilled to be working with two British companies on this landmark initiative to support more sustainable transportation choices for our passengers. Our commitments to the environment and our local community are absolutely non-negotiable – we are determined to address the impact road vehicles have on our neighbours and to improve air quality on our roads. These Jaguar I-PACEs are the latest in a long line of initiatives we are taking to ensure that expansion is not a choice between the economy and the environment – and that we can deliver benefits for both." The new Jaguar I-PACE – available to order now from £63,495, excluding government incentives – is Jaguar’s first all-electric model, and a key milestone in its commitment to provide electrified variants of its whole model range from 2020.